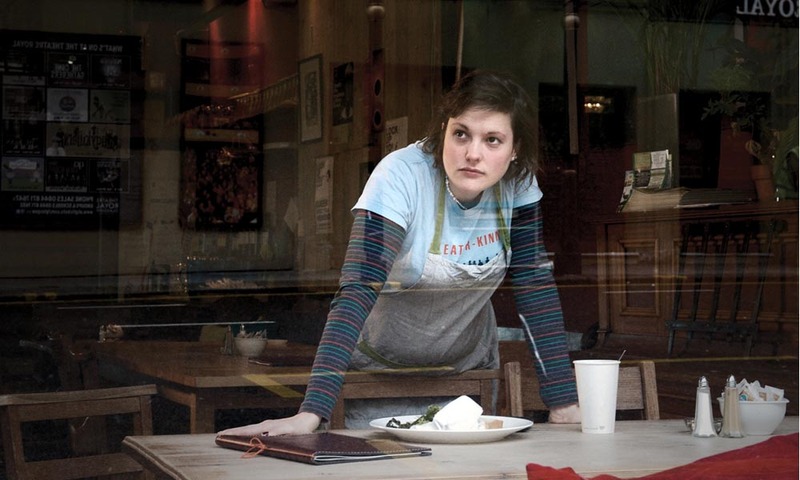 “We have a connection!” Josie Long says to the stranger on the bench. She gestures to their mutual friend: the books they’re reading, written by the same author. Nearly digging his face into the pages, the man pretends that she doesn’t exist. The first of two short films written by and starring the comedian, Let’s Go Swimming follows its heroine as she moves to “indie theme park” Glasgow to make a new life after a soured relationship. The moment on the bench, which comes early in the film, is played for laughs but is as revealing as it is quietly heartbreaking. Lost and lonely, the protagonist finds herself in a world indifferent to what she’s trying to put into it. 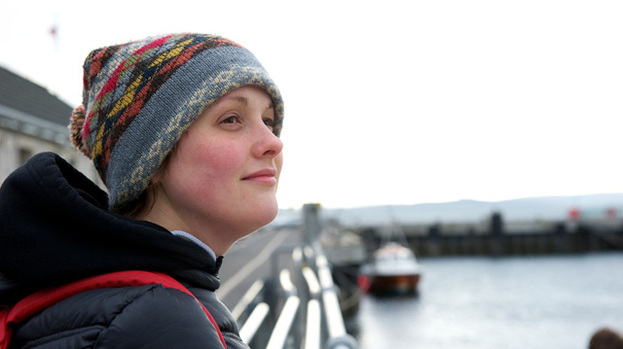 Whilst not quite autobiographical, Josie’s character shares her sincere desire to connect with other people, even if they rarely seem to reciprocate with the same warm enthusiasm. At a time when most short films struggle to find non-online distribution outlets, Josie has taken the novel approach of embarking on a tour of U.K. cinemas with director Doug King to present the films directly to audiences. Battling the afternoon traffic whilst en-route to another screening, we spoke with Josie about her move into filmmaking. What made you decide to take the films on the road? I guess it just didn’t seem as fun to put them on the internet. We wanted to get actual responses from actual people. We also loved the idea of screening them in cinemas. Mostly with short films, if you’re incredibly lucky you might be able to get them on mainstream television, but probably you’re trying to enter them into festivals and that’s it. We are entering the films into festivals too, but we wanted them to have more of a life. What sort of responses have you had from the audiences so far? It’s been great–better than I’d hoped, actually. We’ve been delighted. I’m used to being on stage and you’re kind of in it. You can’t really assess anything as it’s going on, but when we’re sitting at the back and watching people watch the film, seeing them laughing in the right places and feeling the atmosphere in the room, it’s incredibly thrilling. Is it strange for you to be on tour but not have to perform a full stand-up set? Yeah, it’s really odd. Doing a stand-up tour is exhausting. When I perform, I tend to do twenty minutes in the first half before my support act and then 90 minutes in the second half, so I’m fucked at the end of it. With this I’m doing a little bit of stand-up in between the films, an intro at the start and a Q+A, but I’m only on stage for a total of about 40 minutes. And for half of that I’m not even the only one on the stage! It’s amazing because it’s so easygoing. It feels like cheating. What made you decide to make two short films rather than fold the material into your stand-up? The films are kind of sad comedies about people’s personal lives and it really didn’t fit in with the stand-up I’ve been doing recently–although some of the stand-up is personal, a lot of it is about other things. I wanted to do something that was more collaborative, and I met Doug and found we were on the same wavelength. Also, while I’m never going to stop wanting to do stand-up–I love it and it’s a huge part of my life–I got frustrated with how ephemeral it is. You put everything into these shows and then when you record them it never quite captures what it was. I wanted to work in a medium that was a little more permanent and durable. You’ve spent your career developing your comedic voice. Was it difficult to write scripts which contain other sorts of voices? That was something that made me really grateful to have Doug there to collaborate with, especially on Romance and Adventure, the second film, because he gave me lot of advice about making the characters more distinct and real. It’s been a challenge. I’m currently writing a feature that we’re making next year, and it’s new for me to properly try to develop characters that are full and not just little ciphers for my stand-up. I feel proud of my stand-up because I try my hardest to make the shows as textured as possible. My last one was about personal things but also about politics, my age, where I was in my life, and all sorts of really silly stuff. I like that you can have several threads in a stand-up show, and I’m trying to accomplish the same in my writing: to make something about all aspects of a person’s life, not just one specific element. Do you think there’s something gained by screening the two films together? I really do. I’m so glad that we can show them together, because I like to imagine that the second film is a continuation of the first one. There’s an 18-month gap between them and they almost feature the same characters–not totally but with enough artistic license to get by. And they were shot in the same locations and with the same actors and crew, so I feel they complement each other well. Even the stand-up I do in between is stuff that I wrote at the same time, so it’s all quite coherent. What do you think you learned from Let’s Go Adventure that helped you to make Romance and Adventure? The first film was all about Doug and me working out how we worked together, what our style was, finding a crew. By the second one it I felt like I’d come on so much and knew so much more, even just in terms of my performance. I’ve done bits and bobs for television and stuff but I’ve never really been so deeply involved in something like this. Also, it’s interesting for me because my personal life moved on quite a lot. Let’s Go Swimming did reflect that I felt really lost and confused at the time, but in writing the film and making all those friends whilst shooting it, things did get better. Romance and Adventure reflects that, I think. It shows how eager we were to make another film, how excited we were by the whole process.